The bestselling, CILIP-Carnegie-Medal-winning novel from Frank Cottrell Boyce – screenwriter and writer of the London 2012 Olympics Opening Ceremony. 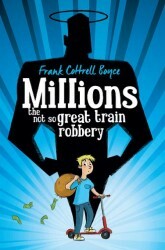 Frank Cottrell Boyce’s story, Millions – the tale of a not-so-great train robbery – is an absolute treasure! Two brothers, Damian and Anthony, are unwittingly caught up in a train robbery during Britain’s countdown to joining the Euro. Suddenly finding themselves with a vast amount of cash, the boys have just one glorious, appalling dilemma – how to spend it in the few days before it becomes worthless. Torn between the vices of buying a million pizzas and the virtues of ending world poverty, the boys soon discover that being rich is a mug’s game. For not only is the clock ticking – the bungling bank robbers are closing in too. Pizzas or World Peace – what would you choose? Includes bonus material and discussion questions from Frank Cottrell Boyce, and with a fantastic new cover look by Steven Lenton.